This is the moment cancer survivor Katie Pake’s dreams came true when she met her hero, Hannah Miley. The 11-year-old from Fife has made a splash winning medals in the pool since losing most of her leg to cancer. She has set her sights on making it all the way to the Paralympics, training four times a week with Carnegie Swimming Club in Fife. And swim star Hannah Miley, who has seven World medals, 14 European, and four Commonwealth Games medals, was the perfect person to give her tips for the top. 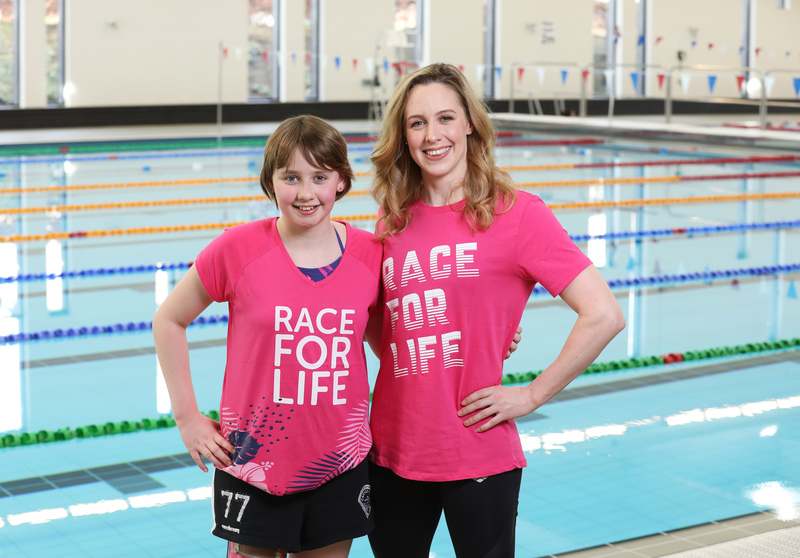 The youngster beamed with pride at Aberdeen Aquatics Centre as she talked tactics and technique with Hannah after the special visit was set up by Cancer Research UK to launch Race for Life, the charity’s series of 5K and 10K events in Scotland this spring. Money raised will help scientists find new ways to prevent, diagnose and treat the disease, helping save more lives. Doctors, who removed the middle section of Katie’s leg, reattached her foot and ankle to her thigh back to front to create a new knee joint. This made it easier for her to wear a prosthetic limb. Now Katie, who only went through the operation known as rotationplasty in February last year, is set to take part in the Race for Life 5K event on June 16 at Beveridge Park, Kirkcaldy. After physiotherapy to help her walk again- Katie who takes off her prosthetic limb to swim is even learning how to dive again in to the pool. Katie, from Coaltown of Balgonie in Fife, said: “I feel free when I’m swimming and I love it. “Cancer made me grow up quickly and there were times when I had to think quite deeply about things. When I’m in the pool concentrating on my swimming stroke I can let all of that go. It’s a chance to forget about cancer for a while. “I couldn’t stop smiling when I met Hannah Miley. I was amazed when I heard that the swimming event Hannah is best known for is the 400m medley. She must have incredible strength and I’ve really enjoyed hearing from Hannah on how I can be a better swimmer too. Double Commonwealth Games gold medallist Hannah Miley, 29, who presented Katie with a special pair of racing goggles and a swim cap said the resilience Katie has shown is worth its weight in gold. Hannah said: “Today has been really special, to meet Katie was hugely inspiring. “I am so impressed and so in awe of her determination. What she’s been through has just been incredible and she’s taken it all within her stride. You can certainly see that Katie loves what she does. “She’s given me such a huge confidence booster. She just loves being in the water and to meet a fellow athlete who is in love with what they do is pretty special. Katie is a pretty special kid and I look forward to seeing where her career takes her and where she goes with swimming. Katie’s mum and dad, Carol and Grant Pake, know exactly how vital the power of research is. They’d first taken Katie to the GP after Katie developed a painful knee which was stopping her from doing the sports she loved. But nothing could prepare the family including Katie’s brother Cameron, 17, for test results on June 16 2017 at the Royal Hospital for Sick Children in Edinburgh which showed Katie had bone cancer. Osteosarcoma is the most common type of bone cancer in UK children. Around 35 children are diagnosed with the disease each year in the UK. Katie started chemotherapy treatment in July 2017 and was scheduled to have surgery in September with medics hopeful at first that they could remove the cancer but save her leg. But it was a hammerblow when more tests that the cancer had also spread to her spine and hips. Katie started a new intense chemotherapy treatment and it was a huge relief just before Christmas when tests showed the cancer had gone from her spine and hips. 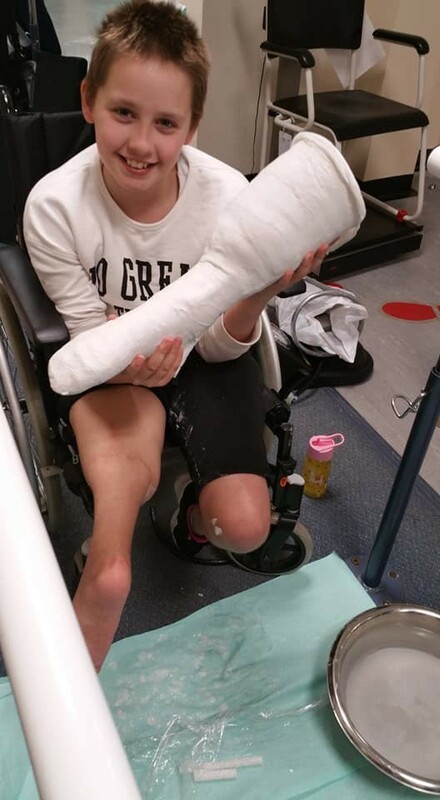 On February 9 last year, just two days before her 10th birthday, Katie endured an eight-hour rotationplasty operation to remove the cancer from her leg. Katie was the first patient to have the surgery at the children’s hospital in Edinburgh. 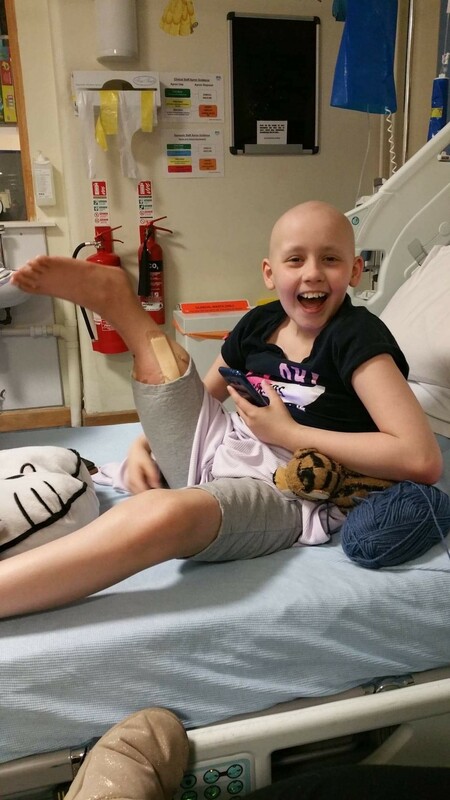 Ahead of the operation, caring Katie asked for the words, “Please recycle” to be written on the section of leg which was going to be removed- telling the doctors she wanted the tissue to be donated to medical research to help other people with cancer. Mum Carol said: “Katie was so brave on the day of the operation but those eight hours were the worst of our lives. Katie endured further chemotherapy, fighting flu as well as other infections during recovery in hospital. She completed treatment at the end of March and the family were delighted to receive the news that there was no sign of cancer. Katie was finally fitted with her first prosthetic leg in August last year. The artificial lower limb was attached to the knee joint created by her foot. Since then Katie has built up her strength graduating from a wheelchair to a walking frame and now uses crutches to move around. Mum Carol said: “Katie wants to be a champion for all children affected by cancer. Lisa Adams, Cancer Research UK’s spokeswoman in Scotland, said: “We’d like to thank Hannah and Katie for supporting Cancer Research UK Race for Life. “One in two people in the UK will be diagnosed with cancer, at some point during their lifetime. Sadly, this means nearly everyone is touched by the disease, either directly or through a loved one or friend. To make a significant difference in the fight against cancer we need to harness as much energy and commitment as possible – so whatbetter way than involving everyone in the community in our events. Thanks to the generosity of its supporters, the charity was able to spend around £38 million last year in Scotland on some of the UK’s leading scientific and clinical research. To join the Race for Life today visit raceforlife.org or call 0300 123 0770.